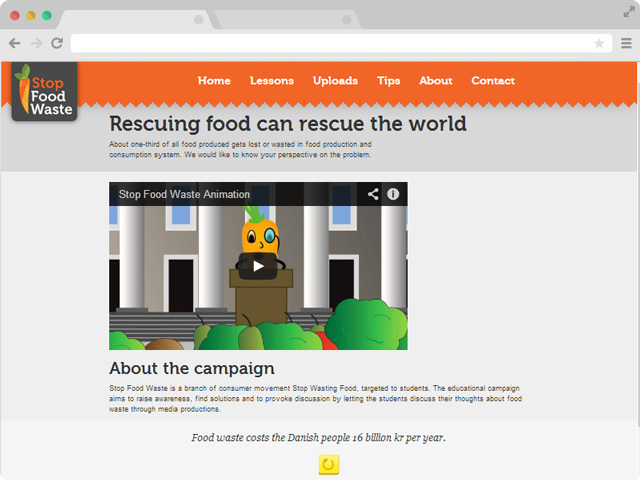 Stop Food Waste is a branch campaign of Denmark's non-profit organization and consumer movement against wasting food. The client wanted us to deliver an informational website with teachers and students as the target audience. The website had to serve as a database for lesson material database. As a team we focused a significant amount of our time on user experience design (target audience, personas, user goals and journeys), and built the rest of the site accordingly. I then worked on back-end features (MySQL database, PHP, JSON, AJAX). Role: Info Architecture, UX Design, Art Direction, Back-end Development.